Welcome to the SoHo Loft Condos, where you can find downtown living at its finest. 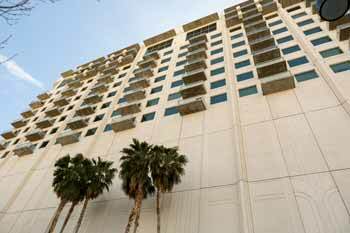 The SoHo Lofts are located in the Arts District of Las Vegas, just north of the Las Vegas Strip. Trendy bars, world-class restaurants and cafes surround this exquisite 16 story solid concrete complex. The SoHo Lofts have a contemporary design and feature large floor plans with an elegant minimalist style. All units feature 11ft high ceilings, with expansive views of the Las Vegas skyline, plus luxury upgrades like polished concrete floors, exposed mechanics like water pipes and duct ventilation, Dellacasa Italian cabinetry, granite counter tops and deep soaking Jacuzzi tubs. One of SoHo lofts greatest features is the rooftop sun deck, swimming pool and hot tub. The roof top pool has 360 degree views of mountains, city and of course the Las Vegas Strip. In addition to an exceptional lounging area, the SoHo lofts also have a state of the art fitness center. The property features garage parking and 24-hour controlled access.